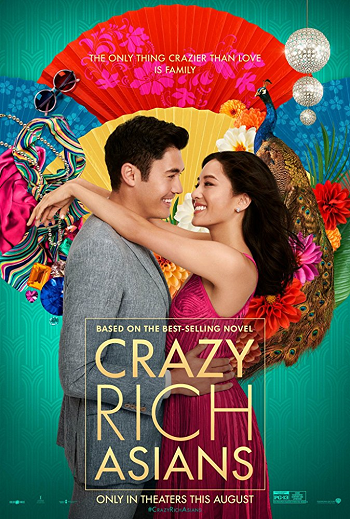 Starring Constance Wu, Michelle Yeoh, Henry Golding, Gemma Chan, Awkwafina, Ken Jeong, Jimmy O. Yang, Chris Pang, Jing Lusi, Nico Santos, Lisa Lu, Sonoya Mizuno, Ronny Chieng, Remy Hii, Carmen Soo, Pierre Png, Fiona Xie, Tan Kheng Hua, Victoria Loke, Janice Koh, Amy J. Cheng, Koh Chieng Mun and Calvin Wong. Screenplay by Adele Lim and Peter Chiarelli. Distributed by Warner Bros. 121 minutes. Rated PG-13. My daughter Leni and I lived in Singapore for two and a half years, so it was with great anticipation that I picked up the book Crazy Rich Asians at my local book seller. I enjoyed the book so much that I picked up copies and mailed them to friends in and outside of the US to share in the Singapore nostalgia with me. Then I proceeded to devour books two and three (China Rich Girlfriend and Rich People Problems). Needless to say, I had some high expectations walking into this movie. We are happy to report that Jon Chu did a fantastic job condensing Kevin Kwan’s bestselling book into the first all-Asian rom-com. From the first scene of the film, a flashback, I knew I was in hook, line, and sinker. Though there were a few moments of straying, the heart of the movie stayed true to the source material. The film adaptation allows for audiences to better experience the Singaporean culture – the Mer-Lion, Satay Street, The Raffles Hotel, Chimes, Marina Bay Sands – and then steps it up a notch by adding in the glitz and glamour (and drama!) of the ultra-rich, old money, posh families. At the center of Crazy Rich Asians, we have Rachel Chu (played by Constance Wu) and Nicholas (Nick) Young (played by Henry Golding), an attractive young couple who met working as faculty at NYU. Nick asks Rachel to accompany him to his best friend’s wedding in Singapore, and the couple embark on a journey to the other side of the world, and into the dragon’s nest that is his family. Rachel is surprised at the airport to be led to a first-class compartment where she is introduced to Nick’s family’s wealth – though nothing he could say on the flight could possibly prepare her for the world she was stepping into. The cast of Crazy Rich Asians is immense, like a Chinese-Singaporean family. There are aunts and uncles, cousins galore, friends and a few enemies. The movie does not have the luxury of the family tree printed at the front of the novel, so be prepared to be a bit dizzy from all of the beautiful people. And they are all so beautiful. There is so much eye-candy between the cast, the scenery, and the food, that it kept me wanting more. Adele Lim and Pete Chiarelli have penned a screenplay with humor, intelligence, and heart. Hopefully, audiences around the world like it as much as my daughter and I did, so we can get the opportunity to see the other two books made into sequels. Leni and I are counting down the minutes until we see Crazy Rich Asians again. I feel certain it will be a movie that becomes a family favorite. Copyright ©2018 PopEntertainment.com. All rights reserved. Posted: August 17, 2018. Tags: Adele Lim, Amy J. Cheng, Awkwafina, Bonnie Paul, Calvin Wong, Carmen Soo, Chimes, China Rich Girlfriend, Chris Pang, Constance Wu, Crazy Rich Asians, family, Fiona Xie, Gemma Chan, Henry Golding, Janice Koh, Jimmy O. Yang, Jing Lusi, Jon Chu, Ken Jeong, Kevin Kwan, Koh Chieng Mun, Leni Paul, Lisa Lu, Marina Bay Sands, Michelle Yeoh, movie review, Nico Santos, NYU, Peter Chiarelli, Pierre Png, PopEntertainment.com, Remy Hii, Rich People Problems, romantic comedy, Ronny Chieng, Satay Street, Singapore, Sonoya Mizuno, Tan Kheng Hua, the Mer-Lion, The Raffles Hotel, Victoria Loke, wedding. Bookmark the permalink.